The bathroom is one of the most widely used — yet, often overlooked — rooms in your home, which is why you should invest in some high-quality bathroom lights for it. 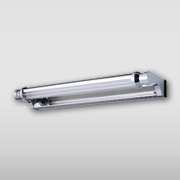 If you’re shopping for new bathroom lights, be sure to check out M&M Lighting’s large selection of residential and commercial light fixtures online. We offer high-quality light fixtures from some of the best lighting manufacturers in the industry including Lutron, Casablanca, and Hadco. 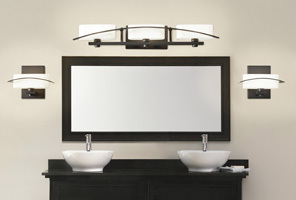 Browse our decorative selection of two-light fixtures to hang above your bathroom vanity, pillar candles to install above the bathtub, or mirrors with lights to display above your sink. 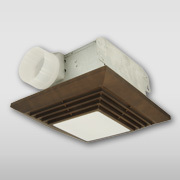 We also offer vent fans for your bathroom, sconces, pendants and more. We have years of experience helping individuals in the Houston community find their perfect lighting solutions — nearly 60, to be exact. Our lighting consultants know lights better than anybody else in this area. Stop by our lighting showroom in Houston today or browse our lighting options online today! We also offer vent fans for your convenience. 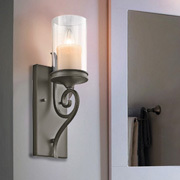 Still unsure of what type of lights will look best in the bathrooms of your home? Don’t sweat it. Schedule an appointment with one of our experienced lighting consultants for assistance today. 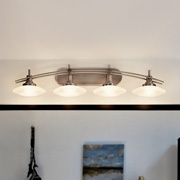 Ceiling lights should be your first focus, as these will set the entire atmosphere and lighting for the room. We suggest recessed lights. 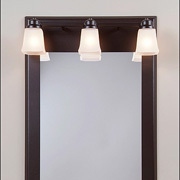 If you’re placing a light fixture above a mirror, make sure it’s narrower than your vanity. When you have a double sink vanity, use the same light fixture above both sinks or invest in one large light fixture that comfortably sits above both — about 5.5 to 7 feet above the floor. 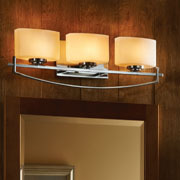 If you prefer wall lights, install a fixture on both sides of your mirror or vanity. Install these wall lights about 5 feet above the floor. 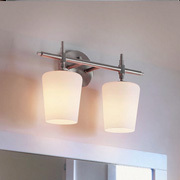 For the most optimized lighting, combine the above tips and invest in wall lights and over-the-mirror lights. This strategy ensures that light is coming from all directions. Make sure any lights you’re using near water for your shower or tub area are wet-rated lights. Layer your lighting. When you have different sources of lighting, you can adjust the lighting in the room to match whatever task you’re accomplishing in it. If possible, include as much natural lighting as you can! Above all else, get creative and choose fixtures that best match the overall style of your home. Your bathroom is where you’ll spend time shaving, putting on makeup and relaxing, so choose bathroom lights you absolutely love. If you’re looking to update and optimize the lighting in your bathroom, look no further than our lighting showroom in Houston. We have thousands of bathroom lights for you to choose from, whether you’re looking to update the ones in your master bathroom or simply hoping to add more to your guest bathroom. We understand not all homeowners are lighting experts. 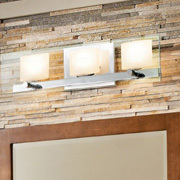 That’s why our lighting consultants are trained to help you find light fixtures that match your style and your budget. 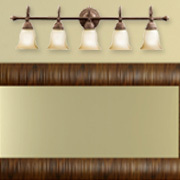 Contact us today for more information, and we hope to see you in our Houston lighting showroom soon!